This Unsweetened Ginger Pear Cinnamon Applesauce is made on the stovetop with gala apples, bartlett pears, and fresh ginger, with no sugar added! Add all ingredients to a medium saucepan and stir until well mixed. Place the pan over medium heat until the water comes to a slow boil, then reduce heat to low. Simmer for 15-20 minutes, stirring frequently, until the apples are very tender (be sure to check an apple chunk; they take longer to cook through than pears). Remove the pan from heat, and blend the apples and pears together in your preferred method until no chunks remain. Use a potato masher, an immersion blender, or a Vitamix on low. It’s delicious when warm, but best when refrigerated overnight. 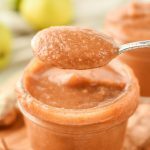 Peeling: Based on my own personal preference, I recommend peeling the pears, but leaving the apple peels on, if you are using a blender to mash the applesauce. The pear peels leave a gritty texture in the sauce based on my tests. If you are not using a blender to mash your applesauce, I recommend peeling both the apples and pears to avoid chunks of fruit skin. Variety of Fruit: Since there is no added sugar, I recommend using a sweeter apple variety such as Gala or Fuji for this recipe. I have only used Bartlett pears, but others may works as well. Ginger: If you are planning to hand mash your applesauce, be sure to mince your fresh ginger very well so you don’t find large pieces of ginger in your sauce! If blending, a rough mince is fine.